The engine is “Rebuilt Precursor” No. 5304 “Greyhound” The reporting number is hard to read. The second digit is 4 and the first one looks like 7 but the third one is illegible. Interesting how the vents on the roofs of the carriages are just below the chimney pots — looks as if there are two rows of vents when you first look at it. Any information welcome. Can anyone identify the location ? 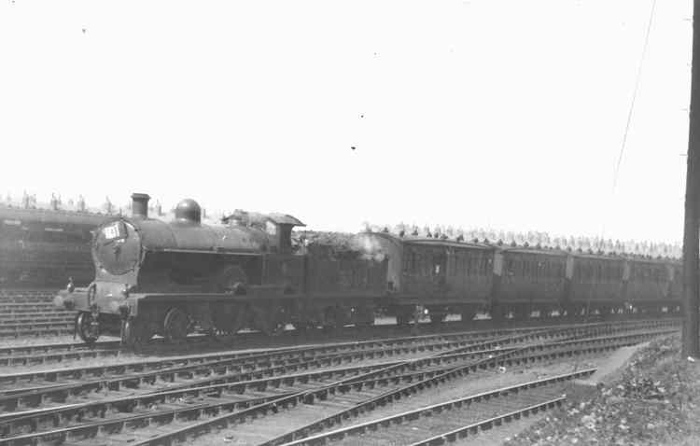 The carriages which were formerly six-wheeled seem to have been reduced to four wheels, and are in the LNWR plain brown livery used for workmen�s coaches. I would guess that they are on their way to the scrap yard. Or conceivably an excursion for colliers or similar. Location � a wild guess, Wigan. I think Philip is mistaken and the carriages still have 6 wheels. Bearing in mind that date and the fact that they are a uniform train, they are almost certainly 30ft 1in and whilst they might be in workmen's livery, could they be in LMS red? On second thoughts I tend to agree with Mike. I'm pretty sure this isn't Wigan; my guess is that it might be Blackpool, with the train travelling south from Central station. Passing the football stadium (immediately to the right, which might account for the platform although I can find no record of a football halt here) the line was twenty tracks wide. The house chimneys in the background seem to fit other old photographs, but the area has all changed now. The reference to a platform is misleading. In fact the structure on the right below the telegraph pole is the capping stones of a short retaining wall. Looking at Foxline No 26 Pt3 an aerial photo of Blackpool Central Bloomfield Road reveals the houses on the far side of the track are perpendicular to the track. In this mystery photo they are parallel. Furthermore is that not a double junction in the foreground? I'm sure Tony is correct about the retaining wall which looks a bit like a platform end, but the row of houses on the left could be in Hyde Road, which lay parallel with and next to the railway in the 1920s. The junction in the foreground might have led into sidings south of the Bloomfield Road overbridge, which (IF this is Blackpool) would be above or just behind the photographer. I'm not wholly convinced about this location, but the Ordnance 25-inch plan of the period should sort it out. I've just looked at the Ordnance Survey 25-inch plan as revised in 1909 and 1930. Both show twenty tracks where I guessed this was, but no sets of points - so it can't be Blackpool. Also, the house-chimneys in the far distance on the right side seem to be in a long continuous row, which also doesn't fit. More research needed! Blackpool North carriage sidings taken from Percy Street looking across to Enfield Road. a single junction still survives . was there a ticketing platform here?